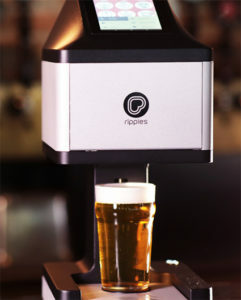 A US company has expanded into the liquor game by releasing a machine that prints text or images directly onto the head of a beer. Ripples launched with a machine that could print high-res images and any text onto the foam of a coffee. Following its success in cafés it has adapted to do the same with beer. Beer Ripples uses an edible malt-based ink to create the impression. It requires no special training, featuring a simple touchscreen, plus incorporating its own app for iOS or Android phones for higher functions. The compact device is wi-fi connected and comes with a library of hundreds of templates, or users can upload their own, such as something supplied by a patron or function host. The ability to turn a beer into something original will undoubtedly appeal to some venues wanting to offer unique experiences. The system costs an initial $3000, plus an annual subscription of $1500, providing enough ink for around 6000 prints. It is currently available in the US and Canada, but Australian distribution is expected in the near future.